Love is celebrated in Wales on 25 January on Diwrnod Santes Dwynwen (Saint Dwynwen’s Day). The tale of the Welsh Patron Saint of Love is one of heartbreak, magic and of course, love, not too dissimilar to the themes used in opera. In the fifth century there lived a King called Brychan Brycheiniog who ruled a large piece of the country, in the area now recognised as the Brecon Beacons. He had several children (24 in total) one of which was Dwynwen, who was said to be the prettiest of all his daughters. Dwynwen fell in love with a local boy called Maelon Dafodrill. Unknown to her at the time, her father had promised her to a Prince and therefore forbade the pairing. On hearing the news, a furious Maelon rushed to see Dwynwen and in his outrage, raped her. Distraught, she fled to the woods and begged God to make her forget Maelon. After falling asleep, Dwynwen was visited by an angel who gave her a mystical potion that erased all memory of Maelon and turned him into a block of ice. God then gave Dwynwen three wishes. Her first wish was that Maelon be thawed; her second was that God answer the hopes and dreams of true lovers; and for her last wish, she wished to never be wed. All three wishes were fulfilled and to show her gratitude, she devoted herself to God. She fled to Llanddwyn Island on the Western side of the Island of Anglesey where she became a nun. She then established a monastery where she remained unmarried. Heart-wrenching themes are at the heart of our Spring 2019 Season. Love, self-sacrifice and exploration are at the core of The Magic Flute. Tamino and Pamina fall in love but the pair must learn about the world and undergo a series of trials in the temples of Nature, Reason and Wisdom to earn the right to be with each other. 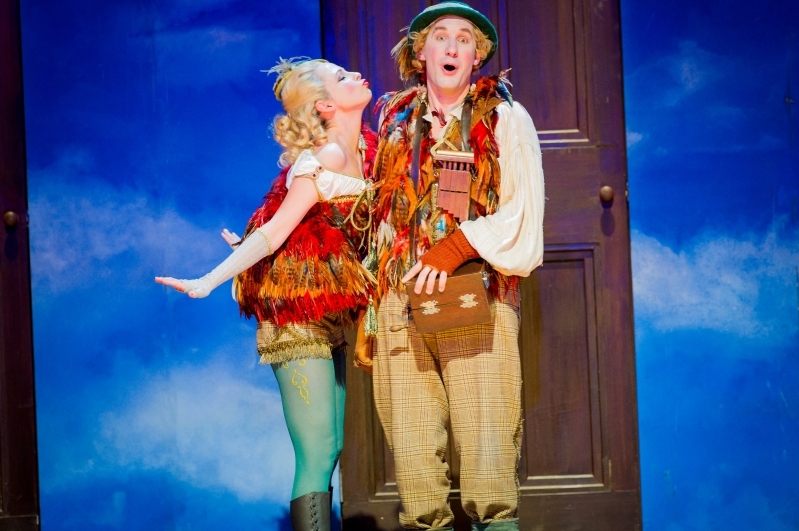 During the trial of silence, Papageno – the bird catcher – breaks his vow by talking to Papagena, a servant who has assumed the disguise of an old lady. Once he has agreed to give up his old ways and pledge lifelong fidelity, she reveals herself as a beautiful young woman – the apple of his eye – but as he has disobeyed the vow of silence, she is driven away from him. Mystical powers help unite love. Unrequired love and forbidden happiness forces Queen Elizabeth I to lay bare the conflict between her public duties as ruler of England and her private feelings as a woman in Roberto Devereux. She loves Roberto Devereux but he is secretly in love with Sara (his friend’s wife), who he refuses to renounce, leaving Elizabeth heartbroken and compelled to sign his death warrant. In order to gain his freedom he simply has to present the ring Queen Elizabeth I has bestowed upon him. Culminating in a shattering finale, Elizabeth realises that Sara is her rival and tries to stop the execution. Love, power and politics collide in Un ballo in maschera. Riccardo is delighted that his true love, Amelia, will be attending the forthcoming masked ball. Unfortunately she is already married to his friend and advisor Renato. As Amelia and Riccardo declare their love for each other, they are interrupted by the arrival of Renato. To avoid being recognised, Amelia covers her face with her veil while Renato tells Riccardo that he is in danger from conspirators. As he flees, the conspirators arrive to confront him and Amelia’s identity is revealed. Renato assumes that his wife and his friend are involved in an adulterous love affair and condemns one of them to death. As the title (in Italian) suggests; the drama unfolds at a masked ball. Join us for a spine-tingling season of operas this Spring.